What happens when you combine a traditional Russian food with an American classic? 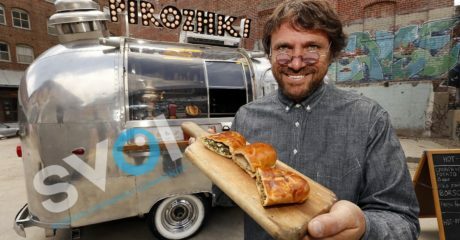 Igor Avramenko, an émigré who lives in Los Angeles, may have discovered the answer in 2015 when he began selling pirozhki (rolls filled with a variety of fillings) from a shiny 1964 Airstream Bambi trailer. Check out Igor and his assistant, “Pirozhki Ambassador” Nastasya Vishnya, at their location in the arts district of downtown Los Angeles.